After the successful cult albums Brainwashing and Blood in Face, Yelworc's style has inspired many bands. 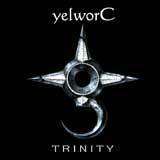 After a long absence, Yelworc is set to return to the forefront of electronic music and recapture their place in the clubs with the concept album Trinity. Illustrated by extraordinary artwork, the excellent arrangements of Yelworc offer a dark diary of a journey through hell. Harsh beats, deep bass, insistent vocals, and atmospheric sound collagen take the fantasy of the listener on a wild ride into a dark world of bloody nightmares. Visionary sound spaces built up with high standards and accentuated by brutal sound effects, complete a symphonic drama with tempting melodies that flatter the ears while causing spines to tingle. Discover Yelworc before he discovers you! On Metropolis.